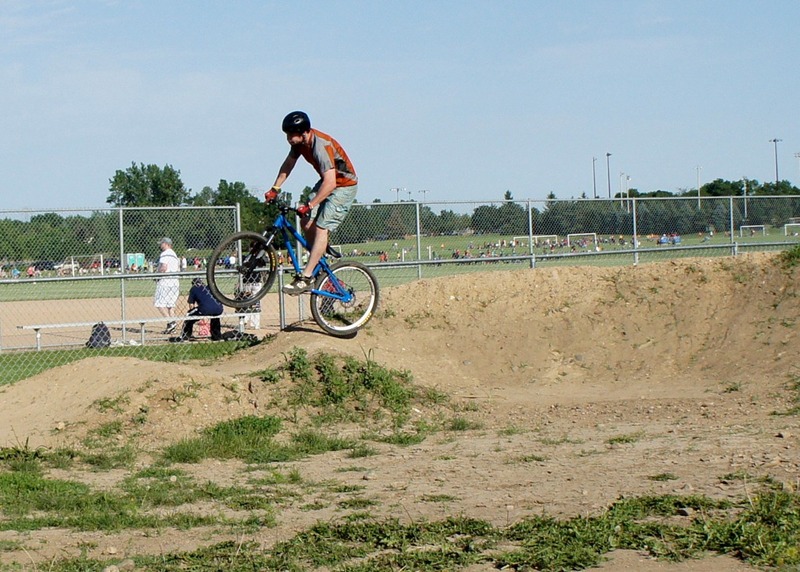 Back in April, I blogged about the opening of the pump and jump park in Eagan, adjacent to the skate park at the Lexington-Diffley Athletic Fields (Google map here). 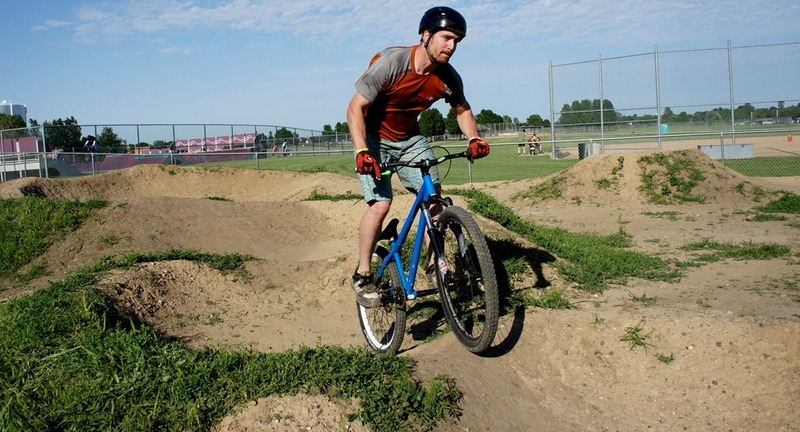 The idea of a pump track is to ride it around and around without pedaling. As I wrote back then, on my first stint, I was able to eventually get around the beginner track on my 29er hardtail. Hard work but fun, once I got the hang it. When I rode Lebanon Hills a few days later, I noticed that I was able to transfer my newly acquired and modest pumping skills to the rollers there. I was pleased. 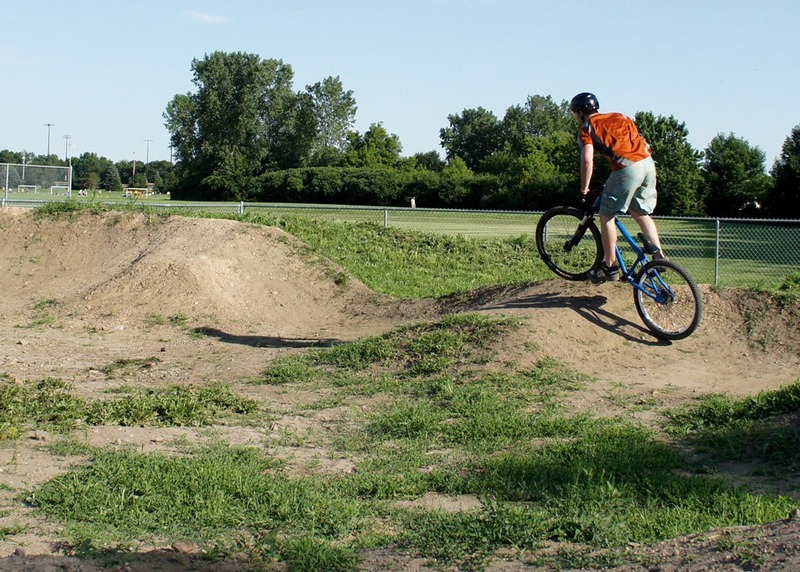 I did a couple of more sessions on the beginner pump track before I went to Cuyuna Lakes MBT Festival in June. I was ecstatic. I could not believe how much more fun it was to ride Cuyuna’s roller-infested flow trails. Every little rise and dip in the trail became an opportunity to accelerate without pedaling. In late June, I took some photos of Chance Glasford as he zipped around the intermediate and advanced Lexington pump tracks on a 24 inch BMX bike. 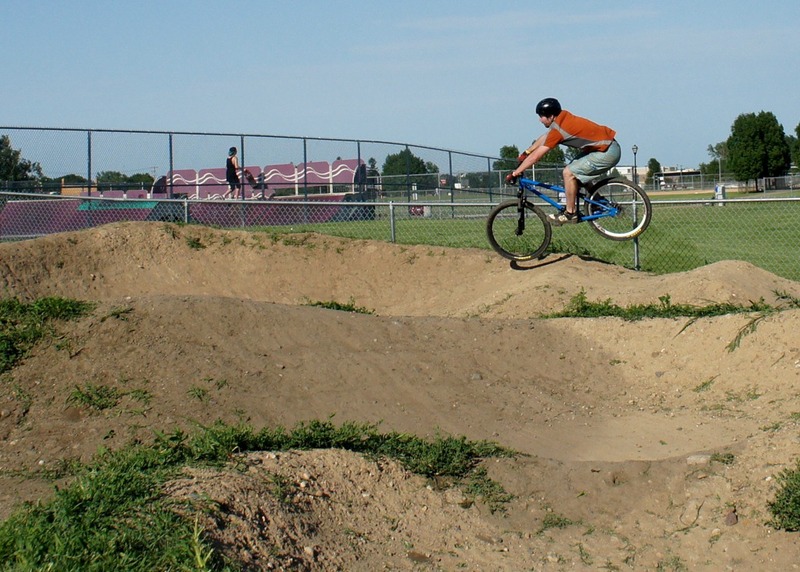 Chance could get going so fast that he could manual over two rollers at a time and fly over the table-top jump (right photo above) on the advanced pump track. I haven’t figured out how to pump the berm to keep my speed up. Chance is doing this in the left photo above where you can see he’s coming out of the berm with enough speed to manual over the two rollers that follow it. Earlier this month I put my new pump skills to the test on the 21 rollers at Lebanon Hills (left side of the open field on the beginners loop). After a couple of runs of flying down them without braking, I decided to try to manual over a couple of the rollers. I picked a couple of spots where the rollers were closer together, scrubbed off some of my speed, and voila! Too fun. I don’t know if I’ll be able to completely pump my way around the intermediate track at Lexington, as my 29’er is not the best pump park bike. The big wheels are a lot to pump. I might get a 24-inch BMX or trials bike. 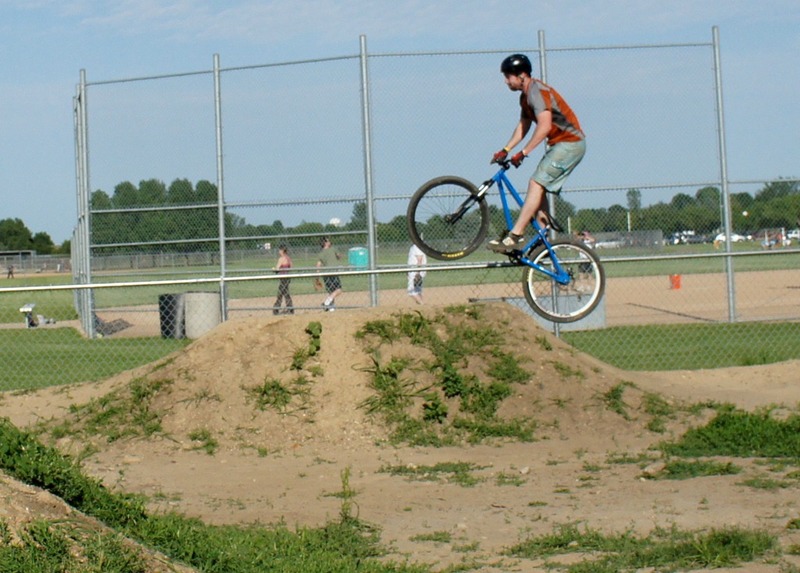 But in the meantime, I can see how regular stints at the pump track will improve my riding. 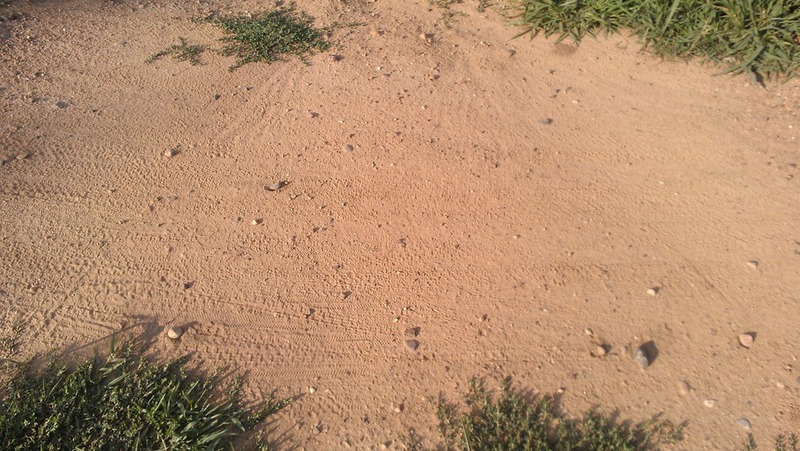 Another surprise: pump tracks need to be swept regularly (loose sand and pebbles accumulate) and then watered down. 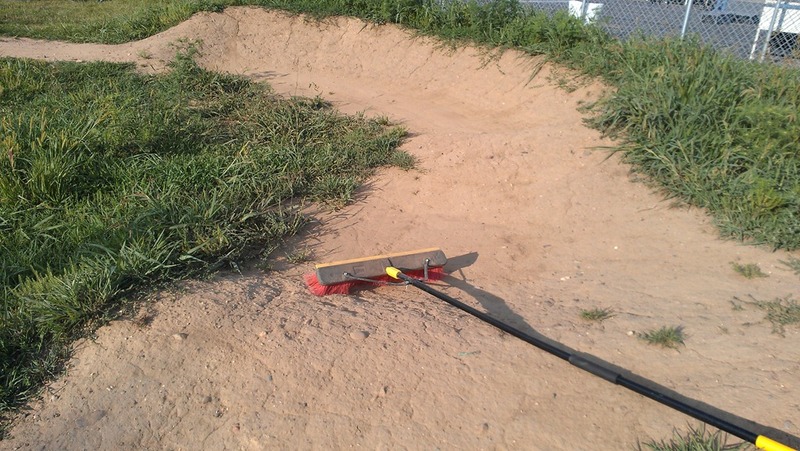 Chance showed me how to do the maintenance of the beginner’s track last Friday eve.